At this time I’d like to welcome the Galesburg Speedway to our membership. It is great to have Ralph Warning and his staff become part of our club. Look at our fan club day schedule for the event date at their racing facility. Once again Welcome to the Galesburg Speedway! Sonny Adams former owner of the Toledo Speedway who had a stroke last year in February is doing nearly 100% as of February of this year.That’s great to hear. Last chance to renew your membership for 2005! We have many exciting things in store for our 40th Anniversary this year and you don’t want to miss any of it so renew now or if you would like to join us just go to the membership link and click and print then mail. Just that easy! 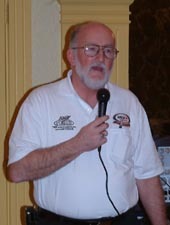 In March at our meeting at the Imperial House Banquet Hall Chaplin Jerry Stewart spoke to all about what Focus Motorsports Ministries does for racers and fans alike from saying prayer before the racers to being with an injured driver as they go to the hospital. Bring the Word of God through racing and to help anyone in need. 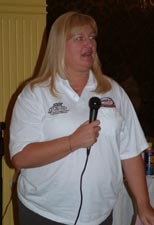 Bonnie Stewart talked about how DRIVEN WOMEN got started and how the wives of racers and fans get together to help drivers and families in need. Newly started they have assisted 2 families during Christmas and raising funds to help others in the future. Contact me for more information on either of these great organizations at president@marfc.org anytime.